Kevin Feige just said that the title for the fourth Avengers movie is a spoiler, which is why it hasn’t been announced yet. He also said that Infinity War and the mystery movie are very different films. 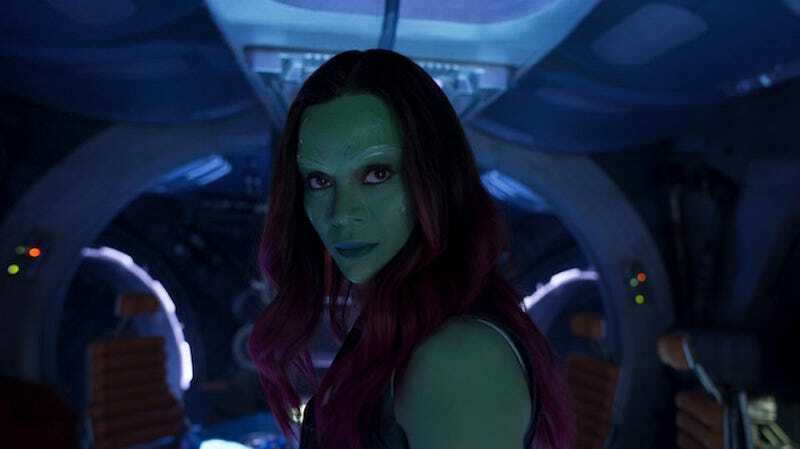 So why does it seem like Zoe Saldana has revealed the title? Logically, she can’t have. BBC News’ Lizo Mizimba has an interview up with Saldana where she says that they’re “in the middle” of Infinity War and then says “we all have to go back for Gauntlet” later this year. If the movie is actually titled Avengers: Gauntlet, there is no way in hell that’s a spoiler. Age of Ultron literally showed Thanos putting on the gauntlet and getting ready to go fill it up with Infinity Stones. If this is a spoiler, the spoiler would be that Infinity War is somehow missing the part where the Avengers fight Thanos while he’s wearing a fully-powered gauntlet. When the movies were Part I and Part II, we all guessed that the first one wouldn’t end with a win for the good guys and I don’t think any of us thought that had changed much. It’s much more likely that “Gauntlet” is a placeholder name that’s being used for the film. Also, Saldana seems a bit unsure of any of this information: “I think that the Guardians just shot their part when it comes to Infinity Wars like the first part? And we all have to go back for Gauntlet later this year.” She could also be talking about a scene or a bit with the Guardians. Still, if the title of the film is something like Infinity Gauntlet, it’s extremely hard to understand Marvel’s secrecy. Unless the full title is, like, Avengers: Cap Is Evil and Has the Infinity Gauntlet, Oops. We’ve reached out to Marvel/Disney and will update if we hear back.